Judge Sam Perry of Glen Ellyn, intending to merely deepen the pond on his property, received much more than he expected when, on October 16, 1963, diggers unearthed a prehistoric femur. Professors from Wheaton College were summoned to investigate. Judging the find to be geologically significant, the decision was made to drain the lake and excavate. After several days additional bones surfaced, revealing 60% of a mastodon. Apparently, the unfortunate creature had broken its leg and died at the site of what had been an ancient lake. Eventually the bones and tusks, meticulously recorded, washed, dried, photographed and coated with dilute shellac, were reconstructed. The skeleton, held together by a steel frame, was proudly displayed in Breyer Hall on the campus of Wheaton College for nearly 40 years, until it was ceremoniously moved to the new science building in 2009. The eight-day dig was accompanied by extensive media coverage and keen interest from the community. The students determined that it needed “a meaningful pet name,” so the skeleton was called “Bonaparte” (bone-apart). But soon the name was forgotten and the display was simply called Perry. 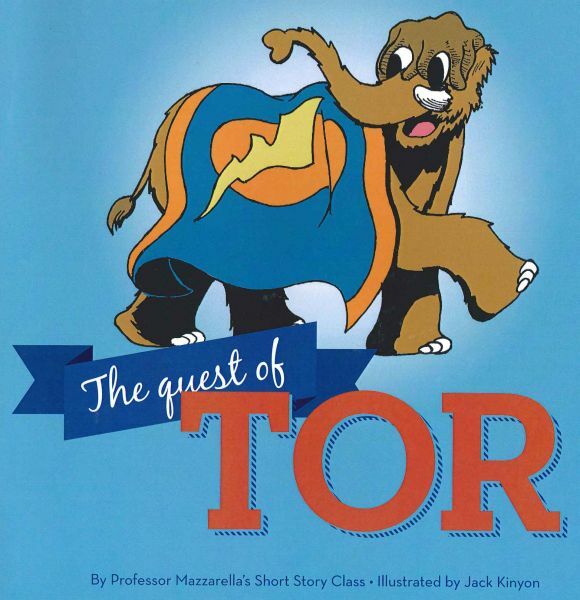 After centuries alone, Perry finally received a companion when Professor Mazzarella’s Short Story Class published, “The Quest of Tor,” explaining the origins of Wheaton College’s new mascot, a young mastodon who leaves his herd and stomps across the United States, searching for “the land of Wheaton,” where a monument has been erected honoring his legendary ancestor. Endearing himself to the campus, Tor is invited by Dr. Ryken to remain. These days at Wheaton College athletic events, Tor is often seen proudly displaying the Thunder banner amid applauding fans. The booklet, illustrated by Jack Kinyon, can be purchased in the Wheaton College bookstore. I love maps I can spend hours poring over the details of a terrain that I have never seen and probably never will see. So when I travel somewhere, I am not content with a generalized map of the area; nothing less than a Delorme atlas with every gravel road marked will do. How nice it would be to have such a detailed map of our spiritual pilgrimage—to have every decision clearly marked and the road for years ahead clear and straight. Some Christians try to get that kind of information out of their Bibles. They search for verses that will tell them what job to take, whom to marry, what school to attend. Of course, they are doomed to be disappointed—or worse yet, to think God is giving them specific direction in a verse that means nothing of the kind. Other Christians simply give up: since God has not told me anywhere what job I should take or what school to go to, it does not matter what I decide. Both these responses miss the true nature of God’s guidance of us through Scripture. God has not given us a Delorme spiritual map revealing every twist and turn of our lives What He has given us instead is a revelation of Himself. Who He is, what He has done, is doing, and will do, and what He values most in His people. By reading, studying, and meditating on this revelation, we find our very worldview being changed. Paul describes this process in his famous call for Christians to “renew their minds” (Rom. 12:2; Eph. 4:23). It is by this transformation of our fundamental attitudes and values that we will be able to “test and approve what God’s will is” (Rom. 12:2). God desires that we so immerse ourselves in Scripture that its values gradually become our values. These values, built deeply into us, will then guide us in all the decisions of life. As my wife and I raised five children (now all grown), we were especially anxious to help them develop these renewed minds. We were not so concerned about whether they would agree with us on every lifestyle decision that we made. But we wanted them to make their own lifestyle decisions, not on the basis of the materialistic cultural values of this world, but on the basis of solidly biblical values. I have a similar vision for the students I teach at Wheaton College. My goal is to expose them to Scripture in such a way that the very roots of their minds will be thoroughly Christian. For if, by God’s Spirit, their minds are being so transformed, I can be confident that they will emerge as strong examples of righteousness in a world that desperately needs such a witness. Dr. Douglas J. Moo is Blanchard Professor of New Testament and Director of the Ph.D. Program in Biblical and Theological Studies. A relative newcomer to Wheaton, Doug arrived in 2000 after a long ministry at Trinity Evangelical Divinity School in Deerfield, Illinois. He holds a B.A. from DePauw, an M.Div. from Trinity Evangelical Divinity School, and a Ph.D. from St. Andrews in Scotland He and his wife Jenny live in West Chicago. Three of their children have attended, or are attending Wheaton College. (Wheaton Magazine, Winter 2004). 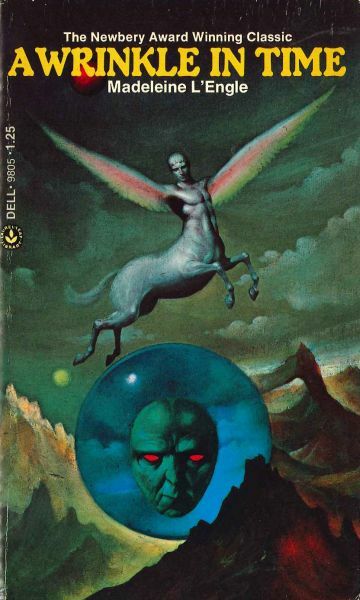 The editors of Amazon released in 2014 their selections for “100 Books to Read in a Lifetime.” Placing sixth is A Wrinkle in Time by Madeleine L’Engle. The Newberry Award Winning classic celebrated its 50th anniversary in 2012. Other choices include 1984 by George Orwell, Alice in Wonderland by Lewis Carroll, Me Talk Pretty One Day by David Sedaris, Slaughterhouse Five by Kurt Vonnegut, Where the Wild Things Are by Maurice Sendak and The Shining by Stephen King. The original manuscript for A Wrinkle in Time is housed at the De Grummond Children’s Literature Collection at Hattiesburg, Mississippi; but L’Engle’s remaining correspondence, artwork and manuscripts (SC-03), including the remaining titles of the The Time Quartet, is housed at Wheaton College (IL) Special Collections. At the request of President Duane Litfin, an Arts Task Force is considering the place of the arts at Wheaton. While Dean George Arasimowicz puts the finishing touches on the first report, we continue to address unimaginable changes in the arts—changes we are trying to take stock of when we consider the trajectory of arts education at a world-class undergraduate institution. So what has changed? This is no surprise, but technology has changed. Plans are under way for new sound, lights, and a projection system for Edman Chapel. Conservatory faculty members are already gearing up to use this system to project subtitles of text- based music performances. We will use it to lead congregational song (words with music, if I have anything to say about it). We will use it to reintroduce visual art to worship. And we will use it to communicate with Wheaton friends in the far corners of the world through the Web. Then, the Chicago Tribune recently published an article titled “The Spirit Moves Them.” The subtitle reads, “Sacred dance troupes transcend the boundaries of worship.” I’ll never forget my experience with movement at a worship conference in Berlin several years ago. The Praise Dance Ministry of Friendship-West Baptist Church, Dallas, danced to a song called “Total Praise.” The African-American church is taking the lead in this area. And movement is just one art form among many being used in the quest for authentic, intimate worship. Attitudes have changed, too. My son Patrick, a Wheaton College freshman, is one example. Pat wants to be a filmmaker. He’s exploring films as diverse as Babette’s Feast and Traffic. In Berlin, the only thing he wanted to see was the Picasso exhibit. His tastes in music range from Shostakovich to Smashing Pumpkins. At the theater, it’s Shakespeare. He wouldn’t think of limiting his engagement with the arts to one stylistic or technical portal. The world of the arts is just too rich and diverse. And Patrick isn’t so unusual. Have you heard the latest recording by banjo virtuoso Bela Reck? It’s called Perpetual Motion—a recording of collaborations with the great violinist Joshua Bell, marimbist Evelyn Glennie, and others. No, it’s not bluegrass—this time—but intelligent, artistic transcriptions of standard works by classical composers. Then there’s Ben Heppner, arguably one of the greatest dramatic tenors of our time. Ben and I sat at dinner one evening last fall with our vocal studies chair, Carolyn Hart, and reminisced about the old John W. Peterson cantatas we sang during our formative years. I want to let you in on a little secret. In a way, I wish music study at Wheaton could be done from an observatory instead of a Conservatory. Our students and faculty are involved in so many exciting things. Keyboard Chair William Phemister is devising a graduate degree in arts ministry. Gerard Sundberg sang the Messiah with the Atlanta Symphony Orchestra last December (by tomoson). Lee Joiner, Kathleen Kastner ’71, Curtis Funk, and Howard Whitaker ’63 participated in the inaugural season of the International Improvisation Institute, collaborating with Ken Medema, Charlie Peacock, Jake Armerding ’00, and others. I just told a student this morning that it’s a great time to work in the arts. Our culture is receptive to the arts. And the church is poised, more than at any time in recent history, to use the arts for Christ and His kingdom. This is why we are so excited to be expanding our arts horizons.